There are two means of obtaining animal flesh for human consumption—hunting/fishing, and domestication. Hunting, an essential widespread practice in the first years of European settlement in the New World, and the universal practice of the native American populace, has been given a bad rap in contemporary American society, in part fueled by such emotionally inflammatory propagandistic fare as the Disney movie Bambi in which the helpless fawn is orphaned by a hunter’s bullet (see similarly the book The Yearling by Marjorie Rawlings). 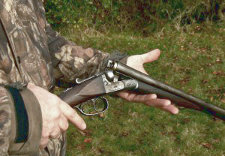 In reality, modern hunting laws commonly prevent taking game during the rearing season before the offspring are capable of surviving on their own, so the story has an essentially faulty premise. Not only so, but in fact, hunting has become essential in our day to maintain the over-all health of several species. In truth, because the original top-of-the-food-chain carnivorous predators—bears, pumas, wolves and such—have been eliminated or greatly reduced in numbers over the range of deer in America, without the regular harvesting of surplus numbers of deer, they would soon over-populate, degrade their habitat, become malnourished, diseased, and subject to widespread death. And then there is the consideration of deer-vehicle collisions on the roadways. My state, Kansas, has some 10,000 reported collisions each year, and almost always at least a few human fatalities. If hunters did not harvest many thousands of deer each year, the number of collisions would increase dramatically. The other option—reintroducing the old predators in sufficiently large numbers (a task requiring decades to achieve)—would immediately prove unpopular as pets, livestock, and school children became the menu choices for pumas and wolves and bears. Oh my. Other, non-game pestilent animals also merit individual extermination for humans’ sake. It is common practice in rural areas to shoot any skunks seen in daylight hours since this aberrant behavior is often a sign of rabies (skunks are otherwise almost entirely nocturnal). I have trapped or shot other animals that threaten my food supply (garden) or property: melon stealing-possums, cabbage-eating rabbits, corn-stripping raccoons (rather, I tried to eliminate the raccoons, which are also a common rabies carrier), and more. While I take no joy in killing such animals, neither do I lose sleep over it. Controlling large warm-blooded furry or feathered pests is essentially no different than controlling smaller man-afflicting pests—grasshoppers, corn earworms, grubs, aphids, malaria-carrying mosquitoes, fire ants, flies, gnats, and on and on. It is evident from Genesis 4 that animal husbandry—domestication of livestock—is actually an older practice than hunting (contrary to the standard picture of primitive man as first a hunter-gatherer, who only later developed farming and domestication. Genesis shows that the reverse was actually the case). Man has domesticated numerous animals—larger animals such as horses, cattle, donkeys, pigs, sheep, goats, even elephants and camels, and more (James 3:7)—as both beasts of burden and sources of concentrated animal protein (milk, meat) as well as leather and wool. Smaller animals—chiefly fowl, but also rabbits, dogs (domesticated wolves) and cats—have been domesticated as sources of food, for pest control (cats and dogs which eat rodents, birds which eat insect pests, etc.) and even for companionship. Man and the animals in such cases have a symbiotic relationship. These animals, which would either perish or suffer greatly in the wild, are fed, protected and cared for by man, and in turn provide man with valuable, even essential products and services. Many—I suspect most, by a large margin—of those who own animals treat them with kindness and care. Naturally, those who derive their livelihood from animal husbandry—cattlemen, horse breeders, hog farmers, dog breeders, shepherds and the like—have a vested interest in the well-being of their animals, as their neglect or abuse will adversely affect them financially. The Bible encourages conscientious animal husbandry: “Be sure you know the condition of your flocks, give careful attention to your herds” (Prov. 27:23), and strongly enjoins humane treatment of animals: “A righteous man cares for the needs of his animal” (Prov. 12:10a). Man has not always acted wisely in his stewardship of the animal kingdom. On the one hand, he has hunted some (relatively few) animals to extinction (we will address this emotion-laden subject later). On the other hand, he has introduced animals (and plants) into new places where they did had not historically existed or been part of the ecosystem. Sometimes this has worked out just fine—the domestic cattle that escaped from early Spanish exploring parties in the American Southwest quickly increased to number in the millions, and became another component integrated into the grazing economy of the southern Great Plains, which included bison, elk, antelope and deer. Likewise, the ring-necked pheasant that was introduced from China into the Great Plains in the late 1800s has prospered and become a valued member of the bird community. Besides serving, in part, as a check on the proliferation of insects, it is highly prized as a game bird, more than filling the gap left by the numerical decline of the native prairie chickens. Its numbers are kept from growing to pestilent levels by weather (cold, damp springs limit reproduction, as do droughty, hot summers) and predators. And there is a long list of imported domesticated animals—cattle, horses, donkeys, sheep, goats, dogs, cats, swine, and more exotic species such as llamas, vicuñas, ostriches and emus. Of these, only rapidly-breeding, disease carrying, plant-destroying feral pigs have developed into a significant problem. Wild horses, which have badly over-populated the range in the West and as a consequence seriously degraded their adopted habitat, could and should be easily controlled by round-up and sale of surplus live animals for human consumption (horse meat is commonly eaten by the French, Belgians and Russians—and in a recent case, unsuspecting Brits who bought made-in-Romania “beef” lasagna!) and pet food, but emotion-driven obstruction to these wise practices long-hindered this obvious remedy to horse over-population (and instead, hundreds of millions of dollars of tax-payer money has been paid to ranchers to provide grazing land for these surplus animals). Some of man’s efforts at introducing non-native species have proven decidedly negative. Starlings, with their oil-on-water iridescent foliage, were imported to Central Park in New York City in the 1890s, and have exploded in numbers, out-competing many much more desirable song birds, and have become a serious nuisance everywhere. Then there is the somewhat less troublesome English sparrow, now found just about everywhere in America. And I would be remiss if I failed to mention the now-ubiquitous (in both America and Europe, at least) South African Rock Dove, more commonly known as pigeons (also known, less appreciatively, as “statue rats” and “flying carp”). Our American hawks do hunt these pigeons, but their numbers are inadequate to control the over-supply. Some well-meaning individual(s) introduced European carp (and in another case, Asian carp) into America rivers and lakes. The aggressive, fish-egg-eating carp have suppressed the numbers of other, much more desirable species. Into the Everglades, irresponsible pet owners have released numerous Burmese pythons, which are having a devastating effect on the populations of ground-nesting birds and other ground-dwelling creatures. And it is not just here in America that man has been a bit too clever for his own good in introducing new species. Domestic rabbits were brought to Australia a couple centuries ago, and having virtually no predators, their population exploded and they soon numbered in the multiplied millions. This hopping horde soon devastated the native vegetation of huge swaths of the continent. Round-ups of rabbits were organized in hope of suppressing their numbers; millions were herded into enclosures and clubbed to death, but with little long-term effect. A rabbit-proof fence has been erected which spans the continent to limit the damage from this man-introduced plague. In Guam, they have an out-of-control population explosion of imported brown snakes (non-poisonous) which apparently arrived on the island from elsewhere as stowaways in the wheel wells of aircraft. Most of the native Guam wildlife has been destroyed by these slithering foreign invaders. Similar and perhaps in some case worse examples could be multiplied. Not exactly the point of the article, but I think there is a real danger in allowing kids to anthropomorphize everything from squirrels to cars. Even adults do it unconsciously after awhile. It plays into all the emotionalism surrounding and preventing true environmental responsibility. Actually, the Brown Tree Snake invasive to Guam does posses a relatively mild venom. And I do wonder what the point of including that situation in this article might be, as it was an accidental introduction rather than an intentional one. Also, there is an ongoing dispute between pet hobbyists and certain FL researchers as to the parties to blame (and in what proportion) for the FL python problem. For me the takeaway is that as fallen humans we make messes, then sometimes make bigger ones when we try to clean them up. And sometimes the mess we make in the first place was trying to fix something that wasn't really broken. Appreciate Susan's point. The "Disney" culture seems so innocent but along w/constant anti-authority and anti-tradition themes, you've got the anthropomorphized and sentimentalized animals thing (we were watching two versions of The Fox and the Hound the other day... the first one is almost impossible to get through). Folks who grow up on large quantities of this sort of thing are bound to pick up some very silly ideas about nature and the environment and life in general.